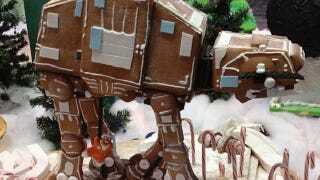 GINGER LUKE | An edible AT-AT from @blackmarketbake @discoverycube as seen on Twitter via ThinkGeek. Confessed mass murderer Anders Behring Breivik was legally insane when he killed nearly 80 people, many children, during a bombing and shooting rampage in Norway in July, according to a psychiatric evaluation ordered by the court, the Associated Press reports. For Some, "Gamer" Still Means "Social Outcast"
Starting next month with 26 channels, FioS customers will be able to start watching live cable TV through their Xbox 360s, the internet and cable provider said today. Should You Buy Mario Kart 7? Yes. Nintendo has been on something of a roll so far this holiday season, releasing a fantastic new Zelda game for the Wii and a triumphant new Mario game for the 3DS. What did the Skyrim Gamer Say to the Skyward Sword Gamer? The Legend of Zelda: Skyward Sword excels at many things. It has great art direction, inspiring level design and so many other good qualities. There are plenty of videos out there showing just how "creative" Battlefield 3 players have gotten with the game's many explosives. The Evidence for Assassin's Creed III Being Set in America. Or China. Or India. Where will the next Assassin's Creed take place? When will it take place? What’s the Best Painting Inside a Video Game? What's the Best Painting Inside a Video Game? Peter Molyneux satire Twitter account remains shut down, but the man behind the parody Tweets tells Kotaku he's working with Twitter to try and get it back up and running.